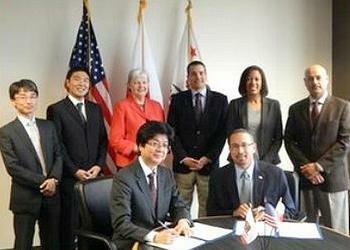 SACRAMENTO, California, October 21, 2014 (ENS) – The California Governor’s Office of Business and Economic Development (GO-Biz) and the Japanese government’s New Energy and Industrial Technology Development Organization have agreed to conduct a feasibility study for an electric vehicle fast charging project in California. The project partners plan to install direct current fast chargers along California highways and provide innovative services for EV drivers including charger location guidance. A letter of intent was concluded last week between GO-Biz Director Kish Rajan and NEDO Executive Director Hiroshi Kuniyoshi, which facilitates a partnership to develop new fast charging electric vehicle stations. Through this project, GO-Biz and NEDO will seek to ease range anxiety, increase intercity trips and promote EV adoption. By analyzing data from electric vehicles, the project expects to show that there is a correlation between EV trip distance and the enhanced effect of both DC fast charger deployment and application services. GO-Biz and NEDO officials hope this project becomes a leading pilot project and contributes to promoting zero emission vehicles in an effort to solve common global challenges. During the six month feasibility study, NEDO and GO-Biz will develop a detailed plan for the demonstration project. The project supports Governor Jerry Brown’s Zero Emission Vehicle Action Plan, which establishes the framework and benchmarks needed for the successful deployment of one million ZEVs in California by 2020. These pivotal DC Fast Charging stations will support an increased number of ZEVs on California’s roads and allow existing ZEV owners to drive their vehicles farther. The agreement is based on the Memorandum of Cooperation on climate change, renewable energy, trade and investment, vehicles, high speed rail and water between the State of California and the Government of Japan, which was signed on September 5, 2014. GO-Biz serves as California’s single point of contact for economic development and job creation efforts. GO-Biz offers services to business owners, including: attraction, retention and expansion services, site selection, permit streamlining, clearing of regulatory hurdles, small business assistance, international trade development, assistance with state government, and much more. For more information visit: www.business.ca.gov. NEDO is a governmental organization in Japan which is in charge of developing energy, environmental and industrial technologies. NEDO was established in 1980, as the largest R&D management agency in Japan. It has close liaison with the Ministry of Economy, Trade and Industry of Japan. For more information visit: http://www.nedo.go.jp/english/index.html.